Our medical signs & waiting room signs cater to the needs of hospitals, medical facilities, health care facilities and doctor's offices. 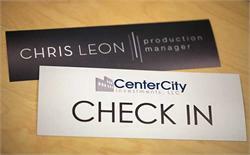 We design custom nameplates and office signs for doors, emergency room markings, exam room door signs, corridor directional signage, co pay signs, and medical office exam room flags. 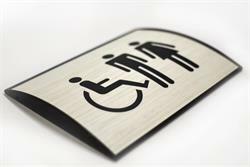 We can customize any one of our standard signs to suit your needs - at no extra charge. If you don't see the sign sizes or colors you need, please do not hesitate to contact us - chances are we can manufacture the right sign for your situation. 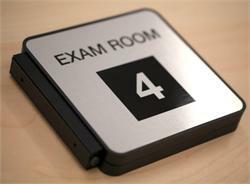 We specialize in custom door signs for offices, medical office signs, waiting room signs, recovery room signs, therapy & lab signs & procedure room signs, numbered exam room signs and hospital wall signage. Office Sign Company is your source for premium health care nameplates, copay signs, room number plates and physicians office door signs. 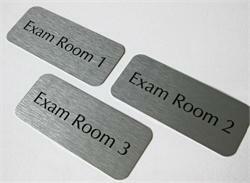 Free logos and custom text on all our medical office signs. Send logos to Artwork@OfficeSignCompany.com or request a digital sign proof. 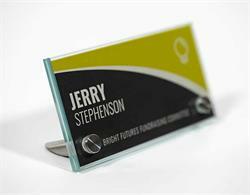 Curved Desk Sign - Popular curved concave desk name plate sign system for the desk or counter, with removable clear non-glare lens. 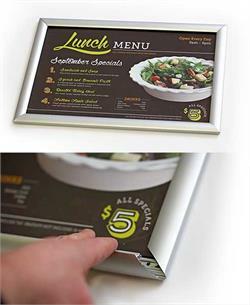 Sign frame accommodates paper inserts that can be easily interchanged by sliding the insert and lens out of the frame. Curved-face sign system, with removable clear non-glare lenses. Curved sign frames includes customized clear lens with ADA and braille as well as free company names, tenant name or room name at no additional charge. Clear insert can be updated. Curved office signs - interchangeable lobby and reception sign includes customizable insert that can be changed in and out of the sign. Aluminum frames come in anodized satin silver or powder coated black with your choice of grey or black end caps. Full color UV printed glass signs with stainless steel stand offs for desk mount. Include any custom text, full color logo, or personalized design at no additional charge. 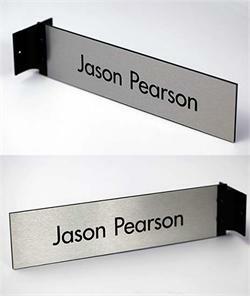 The perfect desk name plate for home or office. 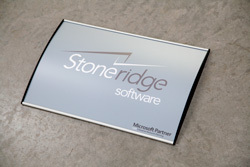 Glass desk signs with stainless steel stand offs for desk mount and standard colored vinyl lettering and design. Include any custom text, logo, or personalized design at no additional charge. A tasteful glass nameplate for the office or home. 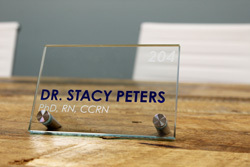 Glass desk signs with stainless steel stand offs for desk mount - interchangeable full color insert. Include custom text, a full color logo, or personalized design at no additional cost. 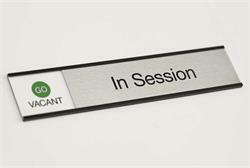 A perfect desk sign nameplate for your home or office. 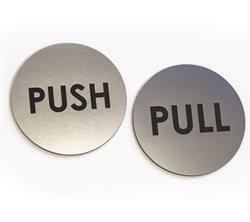 Round, indoor and outdoor durable Push Pull Door Signs Set - available in multiple sizes and color combinations. 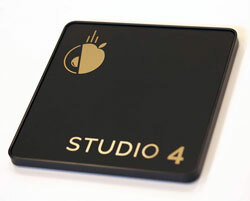 A low profile solution to mark all doors in your facility. 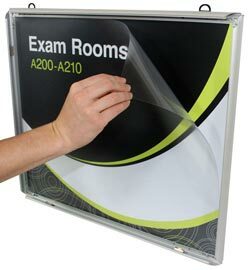 Snap-open wall sign frames quickly open from the front and features a protective and removable, clear non-glare lens. 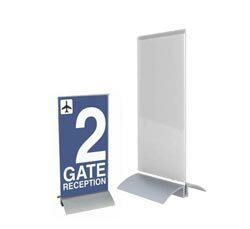 Sign frame accommodates paper inserts, posters and printed materials. Many sizes. QTY discounts, buy in bulk to save. 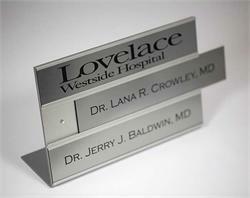 Color coordinating double-insert name plate system. 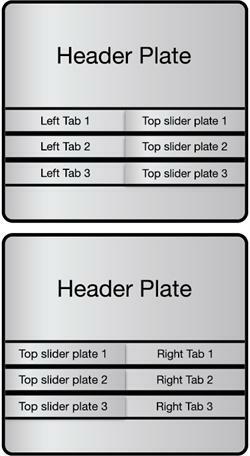 Counter or desk stand displays custom name plates, doctors names, business information or whatever custom text and graphics you need to display. 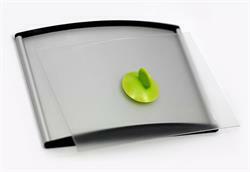 Interchangeable plates allow easy changing of names, etc. 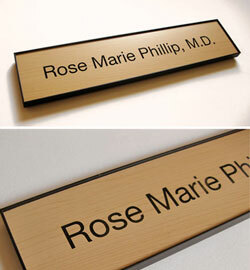 Frameless Office/Exam Room Name Plate Sign - 4" x 2"
4" x 2" Multi Purpose Office Sign Plates. 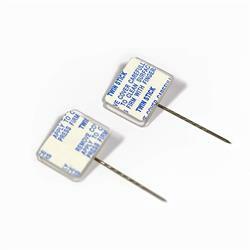 Used in Hospitals for exam room numbers or exit signs. Or personalize this sign with the text/graphics you need for your office sign needs. Great for chiropractors and dentists. *Sold individually. 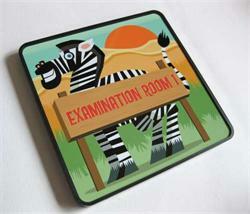 6" x 6" framed custom exam room signs and pediatric office signs. Add some fun and color to your dental offices, childrens clinics and pediatric offices. Custom Text at no additional charge. Custom sizes and designs available. Fun door sign name plates. 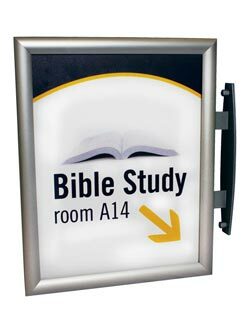 Aluminum sign frame in a brushed silver that snaps open and closed for easy graphic changes. 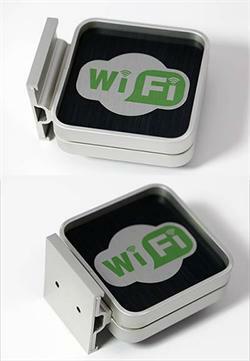 Round WiFi decal with your custom message. 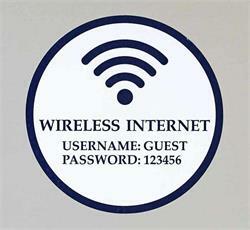 Display your business WiFi password for your patrons or simply display a visible message that you offer free WiFi in your place of business. 3 sizes available and quantity discounts apply. 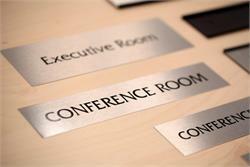 Curved ADA braille wood conference room signs are a contemporary, efficient way to label meeting rooms in your corporate office building, medical facility, school or hotel. Customize with the text you need at no additional cost. Available in many sizes. Contour Cut, Multi-Color Decals with No Smoking symbol and text in various sizes. Available with adhesive on the front side or the back side of the decal. Quantity discounts available. For glass, walls doors and business entryways. 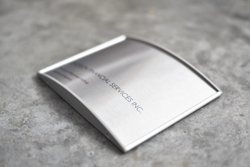 Curved metal office signs with a custom metal insert can be produced with any text, company logo or personalized design you send us at no extra charge. 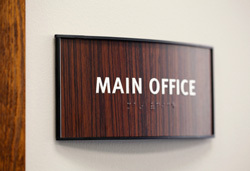 Create a professional looking sign for any office that can easily be interchanged with new information. Contour Cut, Multi-Color No Smoking decals in various sizes. Available with adhesive on the front side or the back side of the decal. Quantity discounts available. For glass, walls doors and business entryways. 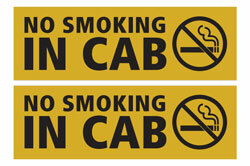 Rectangular No Smoking in Cab decals. Available with adhesive on the front side or the back side of the decal. Quantity discounts available. For glass and smooth surfaces. 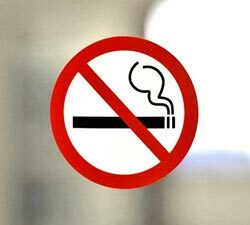 Round No Smoking decals and stickers in various sizes. Available with adhesive on the front side or the back side of the decal. Quantity discounts available. 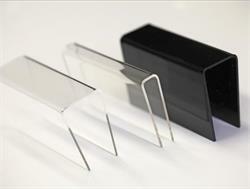 For glass, walls doors and business entryways. 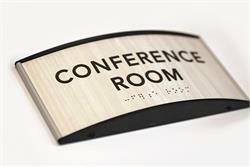 Curved office signs - ADA braille signs feature interchangeable inserts with rich wood finish. 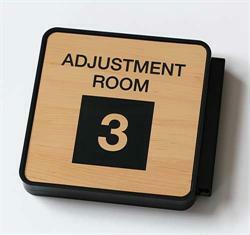 Great way to label any office or medical facility. Signs include metal frames with braille and tactile (raised) text. Choose from a variety of finishes. 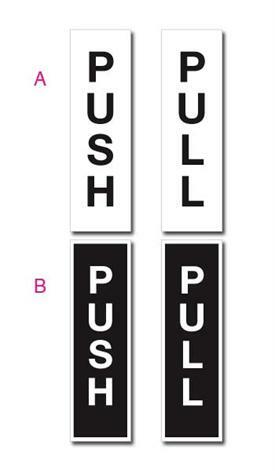 Push/Pull Door Signs to guide customers, patients, guests. A stylish way to display which way your building doors open. 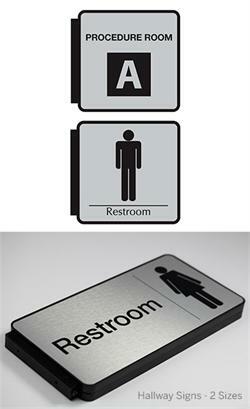 Brushed aluminum push-pull signs in various sizes and colors. Custom 10x9" high metal sign with up to (5) changing message slider areas. 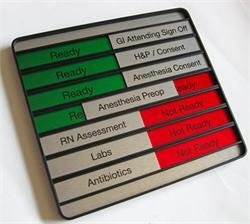 Sliding sign channels to display custom messages such as Available, In Session, Ready/Not Ready, In, Out. Changing message office signs are fully customizable. Free Custom Text. 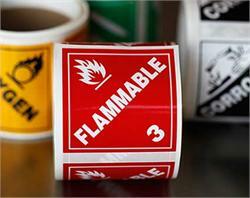 Adhesive-backed hazard labels. Full color hazmat labels and decals available in virtually any size, color and shape. Available in paper stock labels or laminated for added life and durability. UV cured inks ensure long label life. Custom 8"W x 8.5"H braille sign with insert window and slider area . 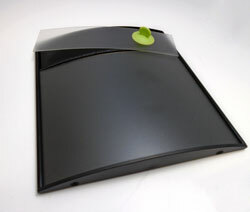 2" high insert area allows for custom inserts to slide in and out of sign frame - this is helpful for room notes, employees names and much more. Slider text to display availability. 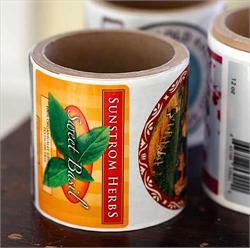 Custom printed adhesive-backed roll labels. 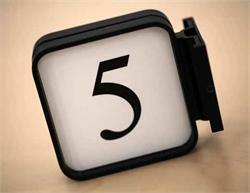 Laminated, full color labels and decals available in virtually any size, color and shape. Laminated stock and UV cured inks for added label life. Quantity discounts when ordering 100 or more! 6" x 6" pediatric kids office signs with full color design can be customized with any text you need at no additional charge. 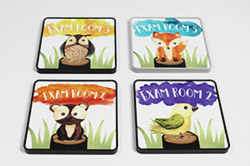 Choose from four standard designs including a bird, owl, bear, or a fox. Available in a variety of frame colors. 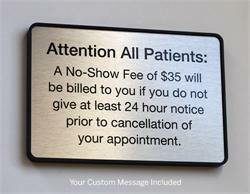 Laser engraved desktop copay signs are a great way to display general information about the policies at your clinic or hospital. Choose from a wide variety of colors and customize both sides with your own message at no extra charge! 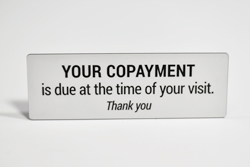 Low profile engraved copayment insurance signs are a professional way to post general information in the reception area of your medical facility. Adhere these signs to the front of your desk or on a wall next to your check in window or lobby area. 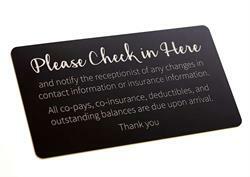 Sleek, professional looking copay check in signs for the reception or check-in areas at your hospital or clinic. Available in many different color combinations. Sign includes standard language, or customize with your own message at no additional cost! 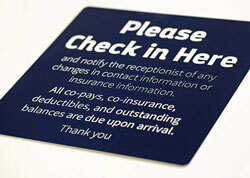 Check in and Copay signs in larger sizes ensure policies and copay information posted on walls in your medical waiting area are easy to read. Include your own custom message at no additional charge. These signs are low profile and professional looking. 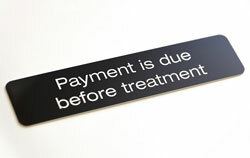 Medical Office Signs for collecting payment at appointments. 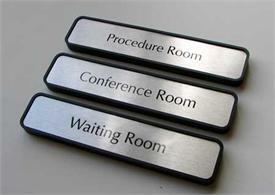 Laser engraved payment due signs for waiting rooms and check in desks available in a variety of two color combinations with laser engraved text. Signs measure 8" x 4". 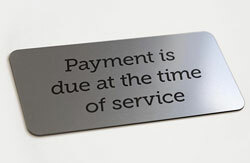 Payment due signs with laser engraved text are a professional option for medical waiting rooms and check in areas. 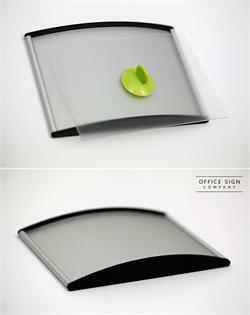 Available in a variety of color combinations to match any office decor. Signs measure 9" x 2". 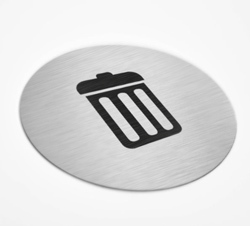 Round aluminum trash signs are a sleek, modern option for marking the indoor receptacles in your cafeteria, break room, lounge, lobby, or restrooms. Choose from a variety of color options and sizes. 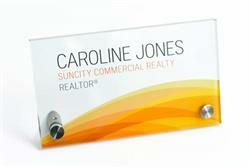 9" x 2" nameplate office sign with easy hang frame. Wall, door, desktop or glass mount. Order as a Waiting Room Sign, or customize this sign to read anything you like for your office sign, doorway, meeting room or desktop, etc. Free Personalization. 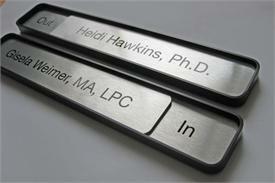 13"x2" Engraved sliding name plate. Custom In Session and Availability text combined with your personalized name or room information text. Free personalization. 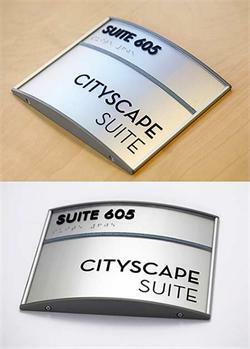 Architectural grade silver metal frame with matching matte silver sliding name plate. Kids Door Name Plates - 10" x 2"
Fun colorful name plates in various designs - free name or room name personalization for your favorite boy or girl. 10x2 full color sign mounted on glossy 1/8" material for a sturdy and quality look. Perfect for kids' rooms and pediatric signs. 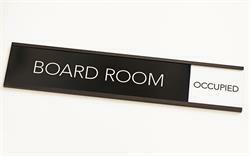 8 x 2 or 10 x 2 Board Room Vacant Occupied Slider Signs are a professional looking option for labeling all of the meeting rooms and conference rooms in your medical facility, corporate office or university. 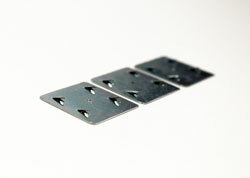 Product includes metal plates and frame. 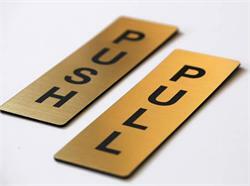 Push/Pull Door Signs Set - Used to guide customers, patients and guests. 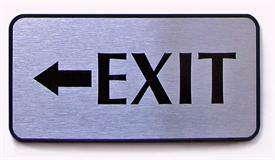 Engraved push/pull door signs are engraved and offer outdoor durability. Colors & sizes available. 1/16"Thick Push/Pull signs. 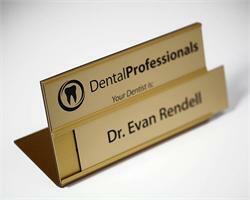 Full Color Name Plate - 8" x 4"
Custom name plates in 8" x 4" frame. Send us your artwork or let us design it for you. Free logos, custom text or any message you desire - no extra charges. 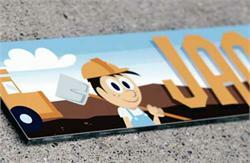 High quality, full color name plates and door signs, made in the USA. 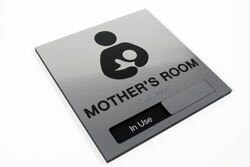 Custom Mothers Room Signs, Lactation Room Signs or custom Quiet Room Signage. 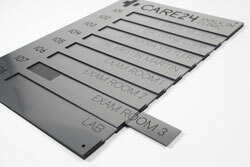 Metal frames and name plates with open frame slider design. Free text personalization at no extra charge. Create your sign with any text you like! 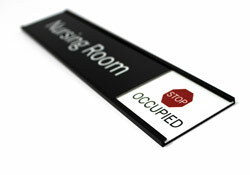 Nursing / Wellness Room sliding availability signs to label your quiet rooms, lactation rooms and new mother rooms. Signs include a metal frame, metal plates and can be customized with any text you need! 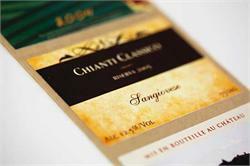 Textured label stock printed with your full color design. Obviously these look great on wine bottles - or any design project you have. Custom contour cut shape made to order - no setup charges. UV cured inks for added label life. Quantity discounts. 6" x 2" architectural metal framed nameplate sign. 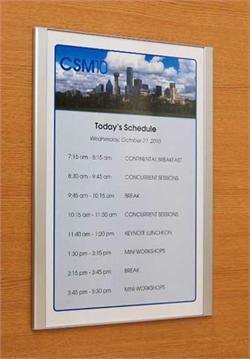 Wall, office door, room signs, glass mount. Choose mounting options for easy installation. Includes free custom, permanent personalization. 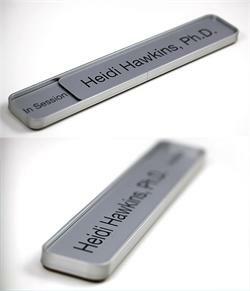 Perfect for cubicle signs, dr. offices or employee nameplates. Custom Room Signs 10" x 2.25" office sign with free custom text. Black lettering on warm wood-tone nameplate. 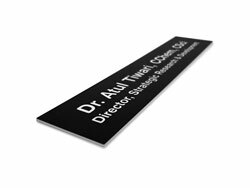 1/8" deep sign plates with a stylish black edge. Ideal for door signs, rooms signs and professionals seeking a stylish employee sign. 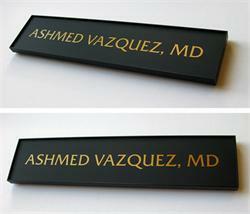 10" wide rich wood tone nameplate with black lettering. 10" x 2" office sign framed in architectural-grade black metal. 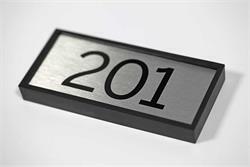 A stylish new look for any room sign, office sign or cubicle nameplate. Free custom text personalization with each sign. Partition Pins - 1 5/8" pins with adhesive square backing are used to hang and fasten office signs and nameplates to cubicle cloth and fabric. Each pin is sold separately. Cubicle pins and fabric pins for cubicle walls and many other uses. 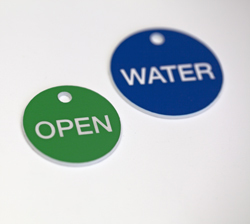 Engraved acrylic valve tags for valve identification or mini door or locker name plates. Multiple Sizes and color choices available. Personalize tags at no additional charge. A great alternative for labels that need to be interchanged. 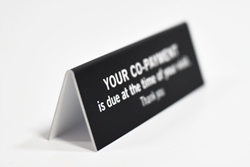 Various sized Co-Pay Signs with your custom co-pay or check in message at no extra charge. 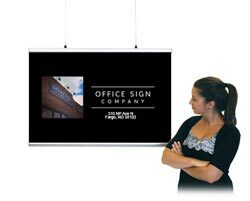 Ideal for hospitals, Insurance companies and any business needing to display a custom message at a front desk, sign area or reception counter. Free personalization. 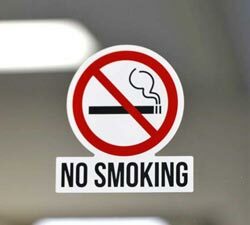 9" x 2" NO SMOKING signs. 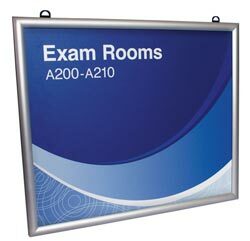 Ideal for office signs, public buildings, hospitals and more. 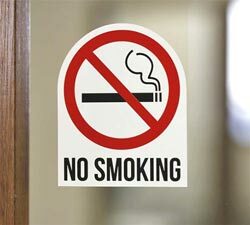 Let your guests know you appreciate them not smoking in your facilities with a contemporary no smoking sign. 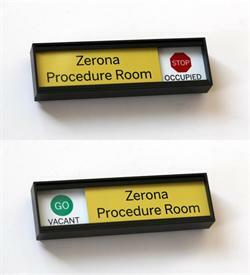 Reception and desk sign system, with acrylic holder. 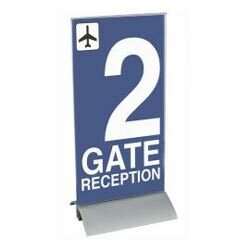 Sign frame accommodates paper inserts--perfect for table displays, front desk messages, hotel lobbies, airport signage and much more. 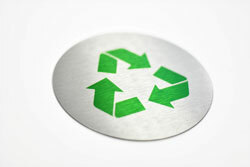 Round, brushed aluminum recycle signs are a professional looking, low profile option for adhering to bins and cans or posting on the wall above your recycle receptacles. A frameless low profile door or wall sign used in hospitals and for marking medical equipment & hospital rooms as well as all types of medical emergency signage & doors. Available in standard or custom larger sizes. 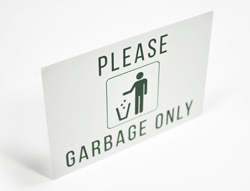 Standard size is 5.75" x 5.75"
Low profile, rectangular 14 x 10 metal GARBAGE ONLY signs are a low profile option for posting on walls above your trash bins or for adhering directly to receptacles. Mark cans in your cafeteria, break room, shopping mall, or lunchroom. 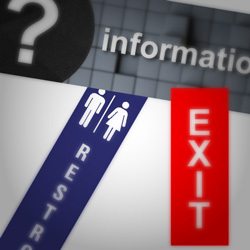 Safety signs for corporations, medical facilities, business or office. 4" x 5.5" signs with any safety caption you need. 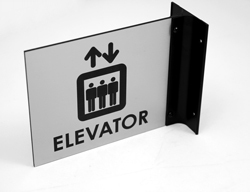 Fully customizable metal signage to display Caution Messages and display safety messages in your production areas or any building. 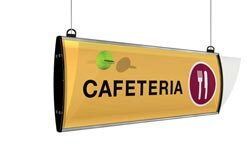 Popular two-sided hanging ceiling sign system with snap open frame and removable clear non-glare lens. Available in an anodized satin silver or black powder-coated aluminum frame. 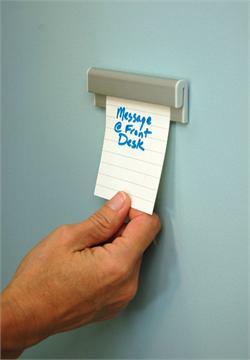 Acrylic cubicle hangers allow you to easily display your office nameplates over a cubicle wall. Simply adhere your nameplate to the hanger and then place the entire unit over your cubicle wall for a professional look. Fangs - metal sign fasteners are an ideal hanging and fastening device for use in hanging office signs and nameplates to fabric and cubicle cloth. 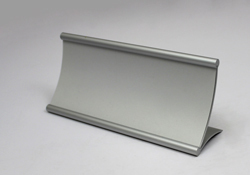 End user is responsible for adhering fangs to desired sign frame, nameplate, etc. Quantity discounts. 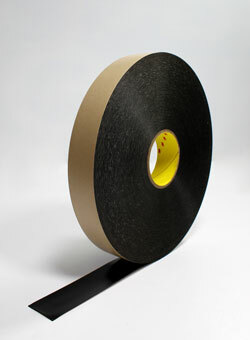 Our industrial-strength double-sided foam tape comes in large rolls that can be purchased separately if needed. 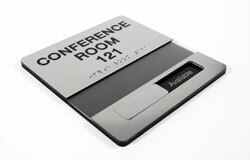 Call us today for office signs and desk name plates you may not see on our web site. Each and every day we create custom office signs and custom medical signs for some of the nation's most demanding professionals. Order with confidence from an industry leader in hospital and medical signs - Office Sign Company of Fargo, ND (701) 526-3835 or simply email us at Service@OfficeSignCompany.com.